Kubota Tractor Corporation introduces its Z400-Series: the Z411KW-48, Z421KW-54 and Z421KWT-60. With a new design combining Hydro-Gear’s Commercial ZT3400 transmissions and largest-in-class low profile tires, the Z400-Series puts exceptional torque and power to the deck with segment-leading ground speed. The series features durable 48-, 54- or 60-inch decks, providing superior cut quality for a variety of property sizes across different turfs and terrains. 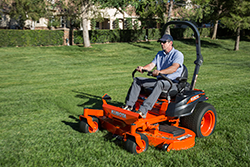 The Z400-Series offers unmatched ergonomics and available features, from the deluxe operator seat to the K-Lift foot pedal mower lift system.